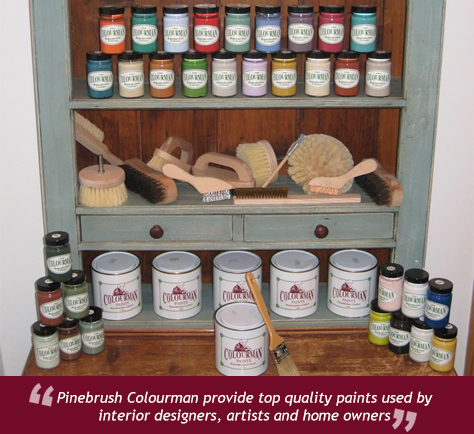 Pinebrush Colourman is a well established family run business, specialising in the manufacture and supply of a range of paints, made to a buttermilk recipe from the 18th and 19th century. Manufactured from natural earth pigments, china clay and aqueous resins, Pinebrush Colourman paints reproduce the traditional effects associated with the buttermilk paints of the 18th and 19th century. The quality, range of colours and chalky feel of the paints really lend themselves to period restoration work. The Pinebrush Colourman provides a colour palette with a vast range of colours, this is complemented by a range of original pine brushes and the drill polishing brush developed to achieve certain paint effects and finishes.